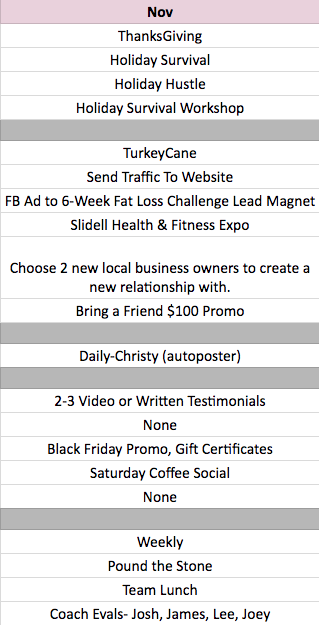 I wanted to share my YEARLY marketing calendar since this is a hang-up for most fit pros. In the graphic, you will see the entire year laid out month by month. Now, this is not to say that there may be some changes such as add-ons or takeaways but this is my compass! This is NON NEGOTIABLE in my opinion. 1. Get the year laid out. 2. From here, build out each month since some monthly tasks are not necessarily related to business growth. 3. 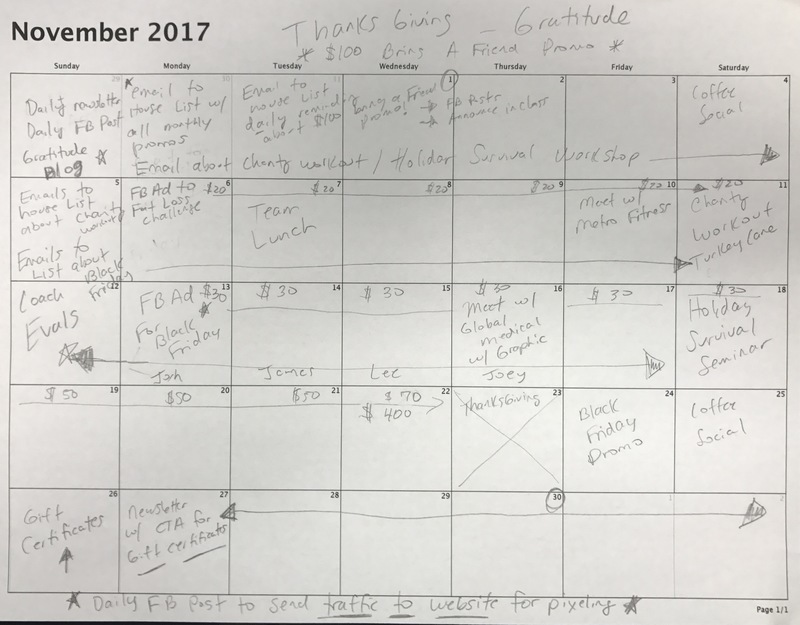 As you build out each month, you will also need to build out a plan of action for each promo, seminar, transformation challenge etc. I do this on a separate calendar with a pencil! For example: FB ads to lead magnet, FB ads to the sales page, FB posts and content, FB videos, Instagram videos, daily emails to list, Blogs, traffic to website etc. This needs to be airtight! How can you make all this work even better?? Get it dialed in and STICK to your plan. Get known and position yourself as the expert in the market. I ask them, how can you NOT do this? No marketing = No leads, No emails, No business! Marketing is more than just throwing a Facebook Ad out there and expecting it to take off. All the pieces of the puzzle need to be there for success.